Get yourselves in gear for the biggest North London party of the year!! The Tottenham Community Festival and Carnival, now in its 15th year attracts an audience of over 10,000 people EVERY year (even if the weather is not in our favour) With an Olympic feel about town , organisers are keen to get everyone on board to help make 2012 a fantastic year for a memorable event in Tottenham. 2011 was a problematic year for every sector of the community and it was with a heavy heart that the decision was taken, by the organisers to cancel the event. With the license in place and granted by the local authority, it simply was not feasible to deliver. With 3 Music Stages, kids area, stalls galore , Youth Zone, Sports, great food and funfair this free entry event offers something for everyone. Over the years, the event has attracted some of the UK’s biggest artists (including Lemar and Sway) and showcases many up and coming young UK talent. One of the most popular areas , as confirmed by Time Out , is the Elders Zone featuring live music , the best of comedy talent and an atmosphere that inspires everyone to enjoy the fun and get into the spirit of Tottenham ‘s biggest party. With a wide diversity of age groups and cultures, this free entry event has become a ‘not to be missed ‘date for the diary for the people of Tottenham and beyond. From humble beginnings in 1997, the festival event enables local business initiatives, whether they are starting out or are well established concerns to avail of the great opportunity to market their services and products to a concentrated audience over several hours. Over the years, both local and National companies have availed of one of the many marketing opportunities offered. Organisers are committed to ensuring that every business , irrespective of size or turnover , has the opportunity to attend the event – from a table top stall space to a standalone marquee or a space in the business village , there is a number of cost effective plan plans in place to enable your business to take part. Our partners include, Tottenham Hotspur Football Club, the Metropolitan Police, Haringey council, The Army, Youth Entertainment Sound System, San Marco and many more. 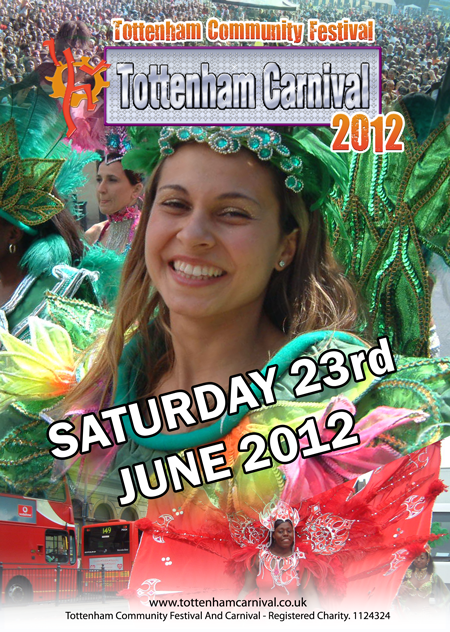 We hope to make 2012 an event to remember with a vibrant street carnival parade and a truly spectacular festival event. We cannot do it without local business support and in return, we can offer you a stake in the biggest and best North London event. Plans for the 2012 event are already underway and we look forward to your continued support."